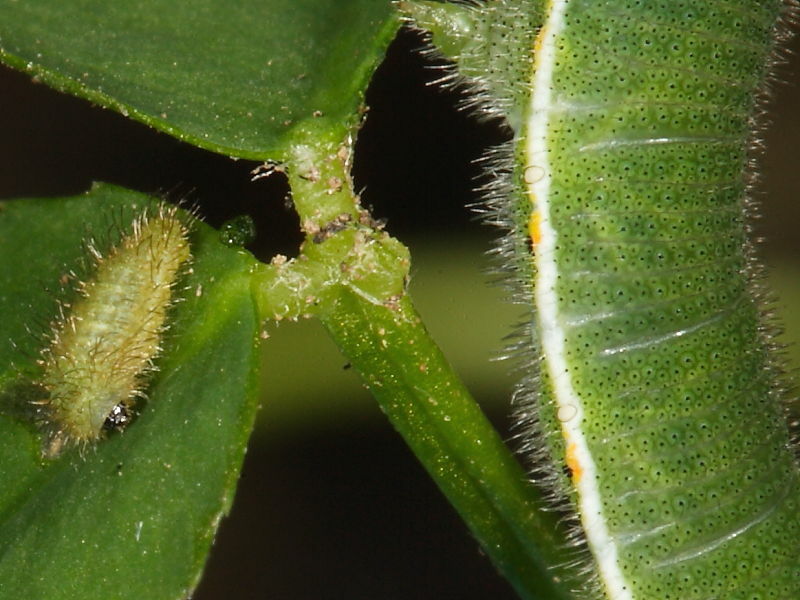 The Clouded Yellow Butterfly (Colias croceus) caterpillars being reared from collected eggs are growing rapidly and have been joined by an unexpected arrival. Clovers brought in from the garden three weeks ago to feed them happened to have a tiny Common Blue Butterfly (Polyommatus Icarus) caterpillar feeding amongst them. A pleasant surprise given that there are very few sightings of Common blue in the garden each year. 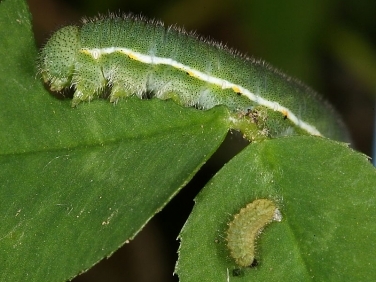 Feasting side by side on the same food plant the difference in rate of growth between the two caterpillar species has been particularly apparent. The Clouded Yellow caterpillars are already 35mm and preparing to pupate while the Common Blue is still barely 5mm and preparing to over winter. Both Clouded Yellows and Common Blues have been seen in recent days laying in good numbers on birdsfoot trefoil and clovers around the Lizard Peninsular coastline in south west Cornwall.